So, the world didn’t end on December 21, 2012 as many believed would happen and the year is quickly coming to a close. This year has been truly and absolutely awesome. For the past couple of years I haven’t really reflected or looked back on things, so today I set out to do exactly that. Let’s go back a bit. I always thought I wanted to be a Computer Engineer and during my junior year I decided to finish 12th grade on a summer program and get into college one year ahead (Fall 2008). On June 2009 I went to this Puerto Rico Startup Weekend event where I met Francisco and Pablo Tirado, Giovanni Collazo, Albizu García, Luis Benitez, Alfredo Richner, Rafael Mediavilla, Guillermo Carrión, and others which were all working on very interesting projects. I think I was definitely the one that got the most out of that weekend. Days later I got my first couple of real freelance gigs an opportunity brought by just going to that event and meeting those key people. Weeks later, Fran and Pablo contacted me to help them work on a big government related project… It was an honor! I worked with them on many projects on and off while I kept studying away, still thinking I liked engineering but having second thoughts. These guys were so understanding: when I had to study and couldn’t go to work, when I got there late, etc. I was getting paid for doing what I love, what else could I want? On 2010 I switched over to Computer Science, something I really loved doing for sure. I spent 2010 and 2011 working mostly with the backend and iPhone app for ReceiptLoader, which we launched early 2011. I also organized the first Barcamp San Juan with Giovanni which was held on November 5, 2010 and a second one later on February 11, 2011, an amazing experience. I spent summer of 2011 coming up with ideas and validating them with Giovanni, Francisco, and Pablo. It took us around 30 days to find, filter, polish them a bit, and validate. We designed “Coming soon” pages with call to actions to get users to subscribe to email lists for products that we hadn’t even built. This was a great process with many lessons learned. At the end of summer there was one project that stood out to Giovanni and I. The idea behind Blimp was born and we took on the challenge, we both left our jobs(I kept on studying) and started working on it. Both of us had money saved up and decided to bootstrap our startup, taking in freelance client work when needed. By September 2011 we had a bootstrap landing page, part of our strategy of trying to get small web development and design related projects to generate cash that would allow us to continue working. We also scheduled an MVP launch for October 10, 2011, launched it, and a couple of hours later, turned it off. 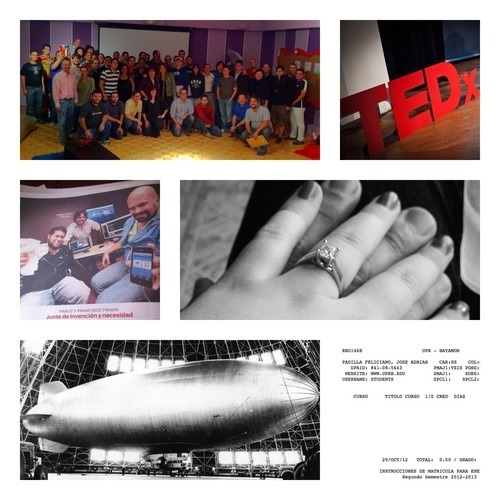 We sent out invitations to 98 users, which in turn invited others into their companies in Blimp. We had more users that we had anticipated and things were blowing up which we couldn’t fix fast enough. During all of these things we also organized Startup Weekend Puerto Rico, together with Ramphis Castro and Marcos Polanco. I was also part of the TEDxSanJuan team that made it possible for this kind of event to happen for the first time in Puerto Rico. 2012 started off with Elving Rodríguez joining the Blimp team. I’m sure that our product would have definitely not be the same if this wouldn’t have happened. Then on February 28, we organized a third Barcamp but this time in the other side of the island, in Mayagüez, with the help of Manuel Messon. By September we had couple of hundred beta testers using Blimp and giving us feedback. In two months we had totally redesigned the app from inside out and worked on mayor revamps and features. We started publishing a series of blog posts that were a slow introduction to a final public launch, talking about how we work with clients and a process for getting client work done. On December 14, 2012 I finally finished my B.S. in Computer Science and publicly launch Blimp: project management for doers. Throughout out all these years I’ve been able to share my life with my high school sweetheart, Ana. After 5 years, on June 15, 2012 I proposed to her after her graduation and she said yes! That was definitely one of the best and happiest moments of the year and my life. She’s been with me through it all, she’s definitely my best friend, my soulmate, and the love my life. She recently got into graduate school and I couldn’t be any more proud of her! I’m starting off 2013 with a very well needed and earned vacation trip with Ana. But as soon as I get back, it’s officially on! I have a bet with myself that this new year has to be way better and way more awesome than past years. Looking back through the years, I’m definitely proud of what I’ve been able to accomplish, learn, and all the people I’ve met and collaborated with. 2013 will be the first year in which I can completely focus on Blimp, our product and anything else I want, no more school. I’ll be able to contribute more to the local startup community and keep the blog posts coming. I can now find more time to spend with my family and friends (and hopefully be able to exercise more often). Thank you Ana, I love you so much! Thank you Giovanni and Elving. Thank you to those of you who made all of this possible.